Antique table clock, French, 19th. 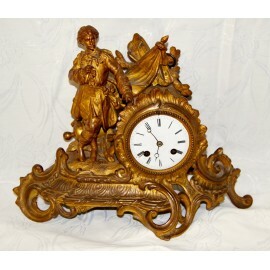 > TIMEPIECES & ANTIQUE CLOCKS>TABLE CLOCK>Antique table clock, French, 19th. Golden calamine table clock, French, signed engraved on the back Ph. Mourey, late 19th. Golden calamine table clock, French, signed engraved on the back Ph. Mourey, late nineteenth century, good condition, works. MEASUREMENTS: 28,5 x 35,5 x 13 cm.